Eddie (Chia-Hao) Hsu is a PhD candidate and Continuing Fellow in ethnomusicology at the University of Texas at Austin. He received a MM in ethnomusicology at UT-Austin (2014) and a BA in dizi (Chinese bamboo flutes) performance from Tainan National University of the Arts in Taiwan (2009). His broader research interests include: nationalism and indigeneity; vocal anthropology; music and labor; music and cultural rights; music in East Asia. His dissertation will focus on the intersection between musical practices of Taiwanese Aborigines, transmission of Intangible Cultural Heritage, and revivalism in contemporary Taiwan. His project has been awarded the Chiang Ching-Kuo Foundation Dissertation Fellowship and the summer grants from Rapoport Center for Human Rights and Justice. Besides his primary research focus, he is also interested in the institutionalization and pedagogy of traditional music in East Asia. His article “Traditional Music for the People: Chinese Music Departments in the PRC and Taiwan” is published in College Music Curricula for a New Century (2017), edited by Dr. Robin Moore. He has presented his research at The 3rd International Council for Traditional Music (ICTM) forum, ICTM symposium of Study Group on Musics of East Asia, Society for Ethnomusicology Southern Plains, and will present at 63rd Society for Ethnomusicology Annual Conference. As a musician, Eddie Hsu has played dizi and nay (Arabic flute), performing with the world music group “Ethnos,” Sangat! (raga-based fusion group with musicians from National Academy of Performing Arts, Pakistan), Indimaj إندماج, UT Middle Eastern Ensemble (Bereket) & ask-i mesk, UT Javanese Gamelan Ensemble, UT Hispanic Caribbean Ensemble, and Adam Rudolph’s “GO: Organic Orchestra.” He has composed, arranged, and performed for many groups and events. His music style is strongly rooted in folk music of Taiwan and China, with interests in exploring various kinds of musical tradition and culture in the world. Eddie has been exploring Arabic and Turkish maqum-based music on nay, and Javanese gamelan. 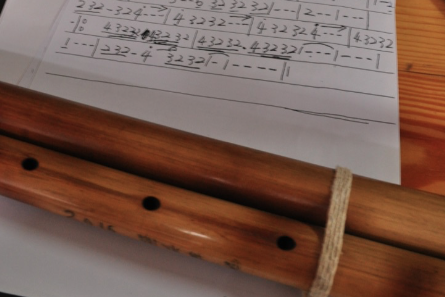 I’ve been working on Taiwanese Aboriginal music, with a focus on nose flutes of Paiwan group and its preservation and transmission project in contemporary Taiwan.